The music written by MAXIMUM THE RYOKUN (Gt/Vo) has both fierce, heavy sound and impressing pop, catchy sound. And the lyrics he writes appear to be meaningless but huge amount of metaphors and sarcasm are hidden behind. The words are mostly Japanese and are very well placed and make songs rhythmical and streamy. 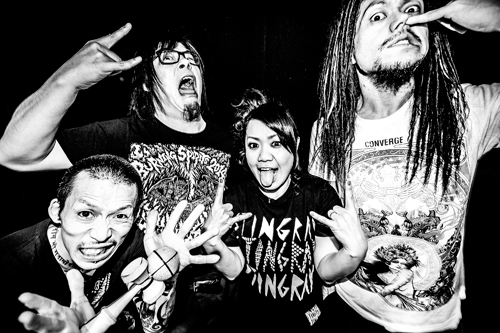 And this makes Maximum The Hormone (MTH) one of a kind in the Japanese music scene. Also, it is rare for this type of bands to be ranked in the major music charts in Japan. The latest album from this band in 2007, "Buiikikaesu (Revive to Death)" which includes the opening and ending theme songs of TV animation program, DEATH NOTE, "What's up, people?! ", "Zetsubou Billy (Desperate Billy)" and hit single, "Koi No Mega-lover (Amorous Mega-lover)" has already sold 400,000 copies and still now keeps selling. The DVD, "Deco vs Deco (Forehead vs Forehead)" released in 2008 entered Oricon (the most representative chart in Japan) music DVD chart at #1. And the assaultive maxi-single, "Tsume Tsume Tsume (Claw Claw Claw)" released in the same year entered the Oricon general music chart at #2 and has sold more than 150,000 copies. MTH has attended many big music festivals in Japan including SUMMER SONIC 06, 07, 08, 09, PUNK SPRRING 07, 08. The band shared stages with METALLICA, NOFX, THE OFFSPRING, RANCID and so on. At these shows, more than 10,000 of audience gather before their stages so some audience cannot enter to the stage areas. In 2008, MTH toured the US with Dropkick Murphys and toured the UK with Enter Shikari. And made one-band tour to France, Germany and Spain. Also attended the biggest rock festival in Korea, ETP. These shows were all successful and got great reactions from locals. In 2009, MTH invited Bring Me The Horizon and Blessed By A Broken Heart as guests and presented exciting shows in Japan. In 2010, the drummer, Nao took her pregnancy leave and so MTH wasn't able to play shows. Now they started playing shows and also preparing for the new title. A triple-A-side EP “Greatest The Hits 2011-2011” (March 23rd, 2011) topped Oricon Weekly Chart for two weeks in a row. On June 17th in that year, MTH performed at the metal festival in France, Hellfest. And went on their second European headlining tour for the first time in 3 years. All these 5 shows were sold out again. It seems that MTH has been quite popular for a while in European countries. At a Japanese music summer festival, Summer Sonic 2011, MTH performed on the main stage with internationally well known bands such as Red Hot Chili Peppers and X Japan. There were crowd of 30,000 in front of the stage. In 2012, the band appeared at many domestic music festivals such as Eikichi Yazawa anniversary event Blue Sky to celebrate his 40 years as a singer and Air Jam 2012 hosted by Hi-Standard. In May 2013, MTH had a chance to play at Ozzfest Japan 2013 with icons such as Black Sabbath, Slipknot and Tool. On July 31st in that year, MTH released their new studio album (5th) for the first time in 6 years, “Yoshu Fukushu” and won number 1 spot on Oricon Weekly Chart for 3 weeks in a row., winning them the Tower Records best seller album of 2013 and Record Shop CD Best Seller Grand Prize in 2014. They are going on their Japan tour starting with a show on September 29th in Hachioji, their hometown and will play 55 shows in total till they end it up in April 2014. Summer of 2014 , MTH performed at numerous well known huge summer festivals throughout Japan and at Knotfest in USA organized by SLIPKNOT with extra headliner show in NYC which all was great success. The latest and overwhelmingly deluxe release pack “Deka vs Deka” (Deka: Japanese word for Giant/ Huge/ Cop ) (5 Disk set of 3 DVD + 1 Blu-ray+ CD / 3 versions ) has topped both charts , the Oricon Music DVD ranking and Total DVD ranking (including Films) , with sales surpassing 100,000 units . ：MTH produced two tracks (Opening & Ending Theme) "What's up, people ?!" and "Zetsubou Billy"